I made this tree for an up coming Dungeons and Dragons game. It's based on a tale from Arthurian legends. The skeletons are shown for scale. I was really happy with the way it turned out since it was fairly simple to make. Years ago I made three wire frame trees from bailing wire. They sat unfinished in a box for over a decade. One of them was covered in green floral tape which is something I had used in the past on wire frame trees. 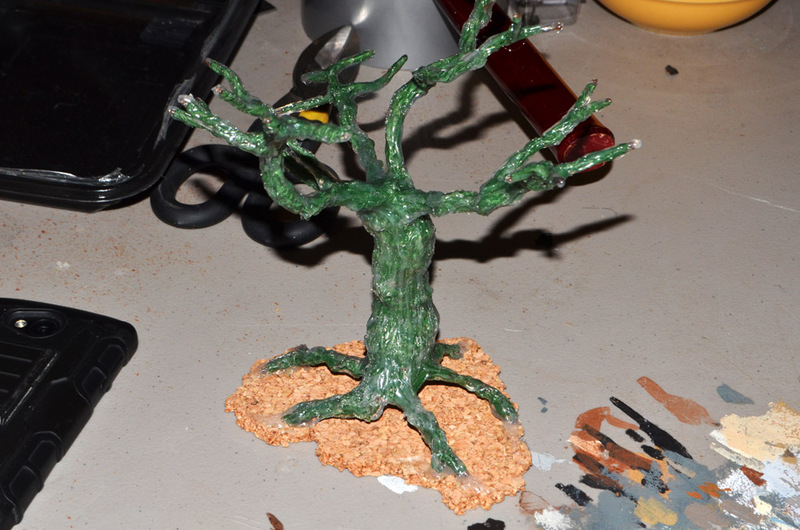 I mounted the tree on a cork board base then used Gorilla Glue hot glue to create texture on the structure. 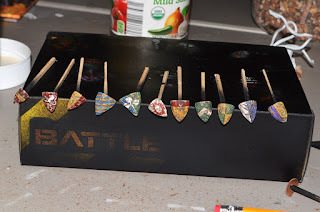 I didn't want to use plastic shields for the tree because now that Games Workshop has stopped making Warhammer it's harder to find good shields cheap so I picked up a package of fake finger nails from the Dollar tree and cut them into shield shapes with a pair of scissors. I had to mark the shield shapes by scoring into the nail with an Xacto knife because I could not draw on them. I dipped them in very hot water to help flatten them out. This distorted some of them a bit but that was okay since they were suppose to look battered and distressed anyway. 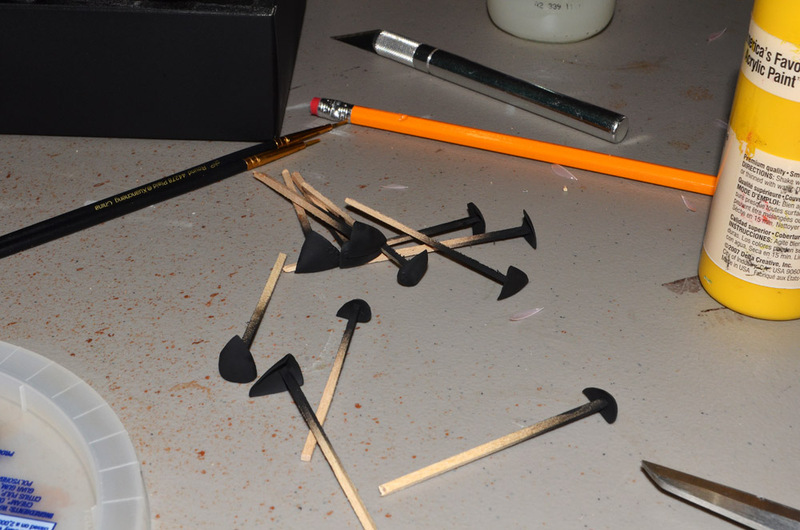 I then mounted them on square dowels and painted them with black spray paint. 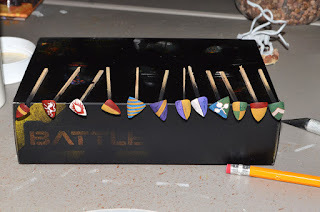 I painted the shields with some quick and dirty heraldry. I didn't get too precise with the painting since I planned to weather these. It's handy to look up the rules of heraldry if you wish to depict it realistically. I've studied it since I was very young. My interest in medieval armor and knighthood led me into Dungeons and Dragons and the Society for Creative Anachronisms. If you have less knowledge of heraldry you should Google "Heraldic rolls" or "Rolls of Arms" which are medieval records of Coats of Arms. 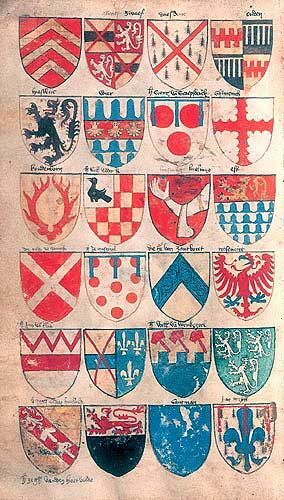 These are a great reference not only for ideas but also the medieval style heraldry is easier to depict than modern versions that you might find if you just Google Heraldry. Here are the shields weathered up. I wanted them to look pretty battered and a bit moldered from hanging on a tree for long periods of time. 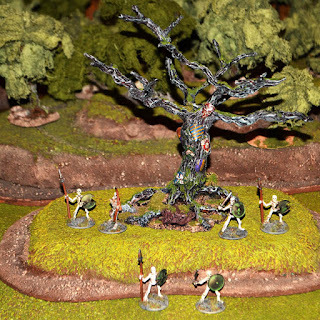 I can't wait to use this project in my next D&D game. It should prove to be an interesting encounter. Those shields turned out really well! 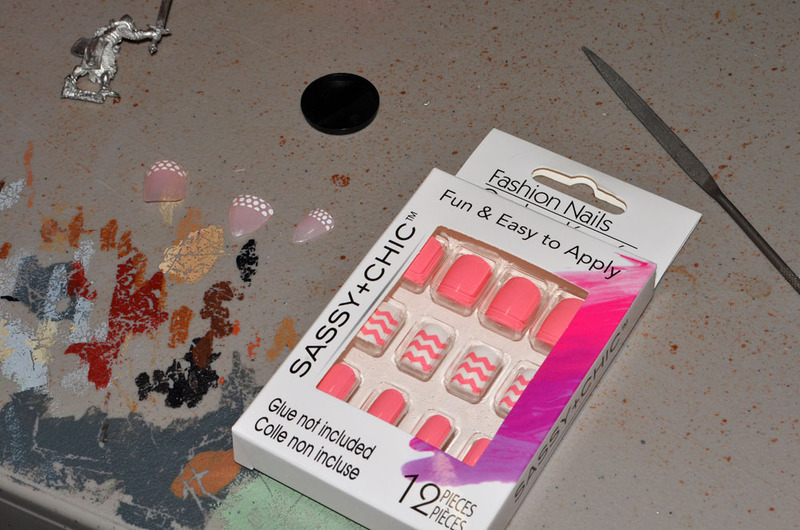 Using fake nails was a great idea too.